Citadel FCU branch staff offered ideas on how to design a branch that encourages interaction between employees and members. The credit union has opened eight branches using that feedback. “We got a ton of ideas about what was working, what wasn’t working, and what members did and didn’t like,” says Pam Krupansky, the credit union’s vice president of retail delivery. Those conversations in 2014 kick-started an effort to introduce a new branch concept. Across the following 12 months, a Citadel project manager and a third-party architect consolidated notes from employee conversations, considered technology needs, and conducted vendor due diligence before rolling out a new concept in 2015 that the credit union hoped would encourage member interaction and deepen relationships. Today, the community-chartered credit union is running this model in eight branches across its footprint. The most recent — a 2,800-square-foot space in Lancaster County — opened in May 2018. Citadel’s new branch, its 23rd, is the second location in Lancaster County. The cooperative hopes to continue reaching into that community, but it needs to increase interest and awareness to do so. 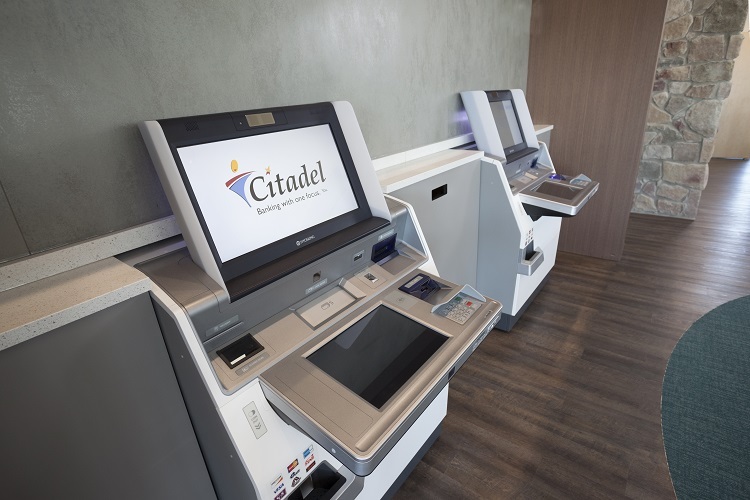 With the new branch design, Citadel hopes to marry efficient technological offerings with personal self-service capability. The new branches include private office space where members can talk with a universal employee and kiosks which allow members to research products, rates, and promotions via handheld tablets. A lounge area in the center of the branch encourages members to “sit down, plug in, and have conversations,” Krupansky says. These branches are not meant to act as transaction hubs. Even the placement of the credit union’s new digital teller machines — near the back of the branch in the front office vestibule — encourages members that come into the branch to do more than conduct a transaction. 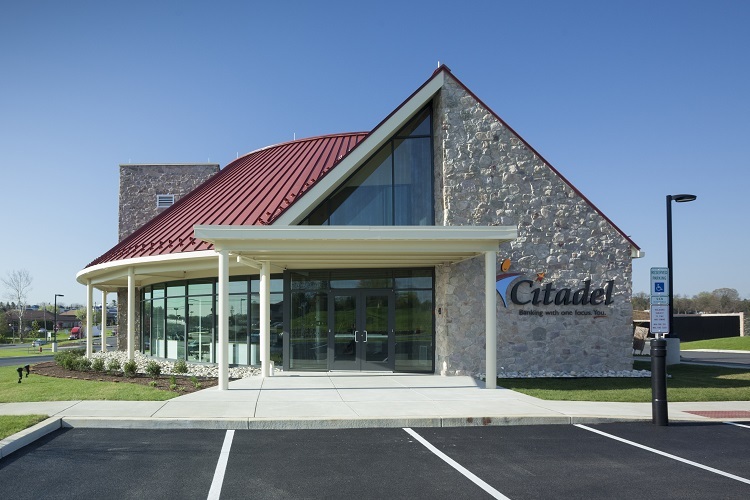 Click through to see Citadel's new Lancaster County branch, inside and out. 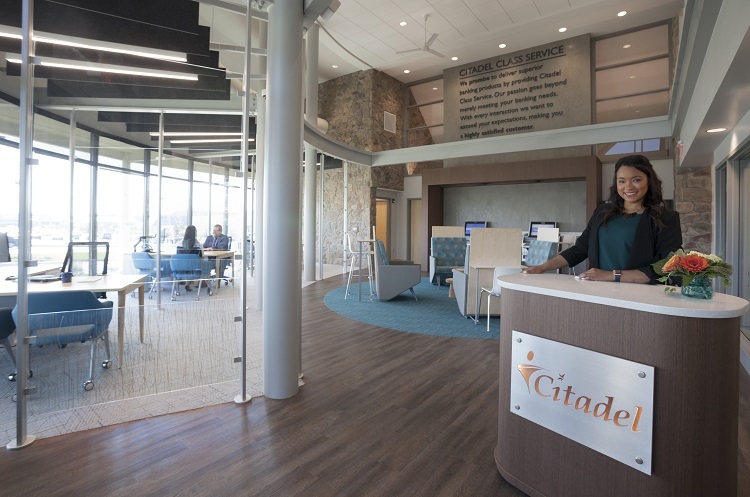 Citadel’s circular branch design allows members to see the full breadth of the service the credit union offers as soon as they walk in the door. Privacy offices, charging stations, customer kiosks, and video conferencing capabilities offer members an improve service experience. Citadel’s express banking machines can handle 95% of financial transactions and employees are always available to assist. The new design includes employee assist tablets that members can use if they get stuck. Citadel’s digital teller machines, called “express banking machines,” are the lynchpin on which the new branch concept works. These core-integrated machines can handle most requests a teller would handle, and all in real-time. Members cannot draw a physical check from their account and they cannot cash a non-Citadel check. Otherwise, the core integration allows 24-7 self-service banking in the front office vestibule, even on complex transactions. “Members can come here to pay their mortgage at midnight if they wanted to,” Krupansky says. With these machines, branch staffers can shed their routine, operational duties, such as handling cash. It takes six employees to operate each of these eight branches — four senior financial service representatives, a market manager, and an assistant market manager — and they instead focus on building member relationships, whether by attending community events or having financial conversations in the branch. Branch managers, or “market managers,” spend 60-70% of their time in business development, leaving the assistant market manager to oversee the day-to-day operations of the branch. The four financial service representatives work on their books of business and attract new members. Overall, employees have taken to the new concept. And thanks to removing cash handling and other operational duties, employees feel safer and more engaged, Krupansky says. They love the new environment. They wouldn’t go back to the traditional setup. But it’s not just employees who benefit from the new branch. To ensure members benefit and don’t feel lost or confused in the new branch design, a branch staffer greets every member at the door and walks them through the technology. Branch staff is getting to know members better, quicker, and contributing to experiences that are largely positive. For example, a long-term member who attended the Lancaster County branch grand opening was reluctant to use the new teller machines. But after the credit union’s representatives talked him through the technology, he was able to successfully complete his transaction. “He said he was going home to tell his grandkids,” Krupansky says. Although, a small percentage of members have been unhappy with or unwilling to learn the new technology, Citadel has recorded a marked increase in the number of interactions that occur at the new branches versus at legacy ones, Krupansky says.